The VAmat® is also frequently employed as an approved aid in clinics, hospitals and other rehabilitation institutions. The VAmat® will therefore, also fulfil all of your personal requirements for safe and comfortable intimate care. 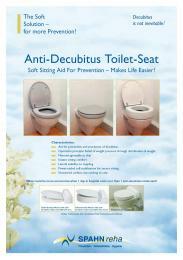 Additionally, anti-decubitus seats and toilet seat boosters are available as options for the VAmat®. 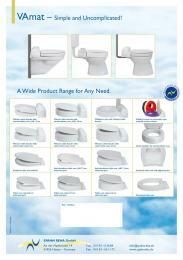 The VAmat® can be mounted on virtually all common toilets! We are committed to working energetically on future developments that will make life easier and more comfortable for us all. Forever there in the line of duty, where hygiene and safety are most important. Hygiene is a daily necessity. It’s a nice feeling being able to rely on a WC douche, like the VAmat®, that adapts to the most varied needs in intimate care. The VAmat®’s douche attachment swings out and back in again noticeably more quickly, so that potential contaminations, for example due to defecation, are avoided. Spahn Reha can also supply the removable douche attachment as an optional extra. This option makes fast and effective disinfection easier, even in a clinical setting. 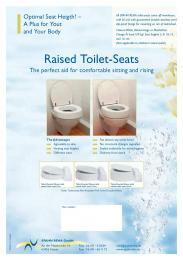 Our toilet seats, which are supplied as standing aids or as anti-decubitus seats, are made of an easy to clean solid material. Result: no hollows or edges, where grime can build up. These are available separately for WCs, as well as in combination with the VAmat. 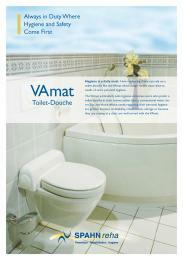 The VAmat® is especially suitable for those who are particularly hygiene aware and prefer a WC douche instead of a conventional toilet within their own four walls. VAmat® is also suited to those individuals, who have to expect more from their intimate care as a result of disability, rehabilitation or age or for those who have for example taken up residence in a clinic. Many years ago, the VAmat® was recorded in the GkV Index of Aids with the accessory number 33.40.05.0001. This can simplify billing the cost bearers for the care providers. We look forward to your request for information.